The playlist for the March 31, 2010 broadcast of the Swing Shift Shuffle has just been added to the playlist filing cabinet. Even though Duesenberg was out of business by the early 1940's, I cannot help but think it still took a lot of nerve to hot rod a Duesey. The Hemmings blog had a post about this custom Duesenberg hot rod built by a car dealer apparently in the late 1940's. Today's Sunrise Serenade was "The Right Kind of Love" by the Four Vagabonds with Janette. Click on the song title for the album page on emusic. Sample clip at Track #10. The Red Hot Lindy Hop lesson and session continues this Friday night. Free admission before 7:00 p.m., and $5 afterwards. The lesson will be with Jaredan and Amanda, followed by music with DJ Jaredan. For the first time since I've been posting each morning's music, I experienced a rerun. It was bound to happen eventually, and I'm surprised it took this long. This morning's Sunrise Serenade was "Fairy Tales" by Ella Fitzgeral and the Mills Brothers. Click the song title for the album page on emusic. Sample clip at Track #20. The sample clip is only long enough to feature the Mills Brothers' section of the song, but you get the idea. Among other events, The People History noted that food rationing began on March 29, 1943 in support of the American war effort during World War II. Be thankful for the full shelves of everything at the grocery. It was not always that way. 29th March, 1943: The rationing of meat, cheese, butter and cooking oils goes into effect when Americans are given ration books allowing the purchase of a certain amount of meat, cheese, butter and cooking oils each month. This followed earlier rationing of gasoline. Nothing says "swing" like a base clarinet. (?) This morning's Sunrise Serenade was "Pell Mell" by Les Brown. Click on the song title for the album page on emusic. Sample clip at Track #11. Just goes to show what happens when one is too easily swayed by advertising. From the Internet Archive: Fox Pop. I saw this item on Golden Age Comic Book Stories a few weeks back, and it reminded me that modern perceptions of past eras often overlook the unusual. When thinking of the late 1940's/early 1950's, the first images to one's mind might be very nostalgic, retro Ozzie & Harriet scenes. This post featuring monthly images from the 1949-1950 Gnome Press Calendars demonstrates that quirky weirdness was alive and well in 1949. My favorite was this "Revenge of the Turkey"-styled image for the month of November. This morning's Sunrise Serenade was "C Jam Blues" by Duke Ellington and his Orchestra. Click song title to listen courtesy of Jazz On Line. Continuing the current trend of 3-D, The Boat Lullabies has been posting a series of amateur stereo photographs taken in the Salt Lake City, Utah area in the 1940's. Stereo photographs appear as 3-D when viewed through a special lens. The site displays the photos by rapidly alternating the left and right portions of each picture to show the three dimensional effect. I'm a bit late reporting today, but the Sunrise Serenade was "Deep In The Heart of Texas" by the Merry Macs. Click on the song title to listen courtesy of Jazz On Line. The playlist for the March 24, 2010 broadcast of the Swing Shift Shuffle has just been added to the playlist filing cabinet. From The People History: On March 23, 1941, Glenn Miller began production on “Sun Valley Serenade.” This would be his first motion picture for the film company 20th Century Fox. Today's Sunrise Serenade was "Organ Grinder's Swing" by Bunny Berigan. Click on the song title for the album page on emusic. Sample clip at Track #23. In addition to the regular Red Hot Lindy Hop lesson and session on Friday, there will be a Sock Hop Social with live music on Thursday at the U of M. FREE!!! Dance and Lesson from 6:30 p.m. to 10:30 p.m.
Free admission before 7:00 p.m., $5 after 7:00 p.m.
Free dance lesson at 7:00 p.m. with Kirk and Kimmie followed by music with DJ Kimmie until 9:30 p.m. Salsa at 9:30 p.m.
Today's Sunrise Serenade was "I'm Going Mad for a Pad" by Anita O'Day and Stan Kenton. 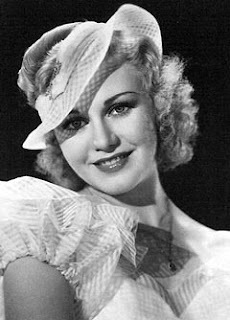 The Turner Classic Movies tribute to Ginger Rogers continues Wednesday evening with several of her films from the mid to late 1930's that include a "Who's Who" of Golden Age Hollywood costars like James Stewart, Katherine Hepburn, David Niven, Lucille Ball, Douglas Fairbanks, Jr., and Charles Coburn. 10:15pm Stage Door (1937) Women at a theatrical boarding house try to make their big break happen. This morning's Sunrise Serenade was "Louisiana Hayride" by the Boswell Sisters. Click on the song title for the album page on emusic. Sample clip at Track #8. Time to bring back the Man of Steel. From 1942 and the Internet Archive, Superman in The Bulleteers. Over on Todd's Serial Experience blog, he posted lists of his favorite serials by studio. He started with the top ten Republic serials, followed by series from Universal, Columbia, and Mascot/Independent studios. I have seen several of the serials in each of his lists, and would have to agree. I need to track down some of the others. Today's Sunrise Serenade was "Swing Is The Thing" by the Mills Brothers. Click on the song title for the album page on emusic. Sample clip at Track #9. Does someone else always get your favorite parking space? Do other drivers cut you off in traffic? Does your current vehicle leave you feeling unsafe? Is the neighborhood association threatening military action because your grass is a 1/4" too high? If you answered yes to any of the above, have I got a deal for you. 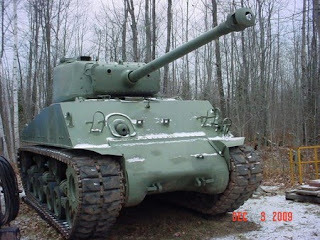 Hop on over to the Hemmings blog for all the specs on this beautiful 1944 Sherman M4A2E8. Granted, it is not the most fuel efficient transport available, but you will not have to worry about unintended acceleration, accidental airbag deployment or heavy machine gun fire. This morning's Sunrise Serenade was "Air Conditioned Jungle" by Duke Ellington and his Orchestra. Click on the song title for the album page on emusic. Sample clip at Disc 1, Track #8. The playlist for the March 17, 2010 broadcast of the Swing Shift Shuffle has just been added to the playlist filing cabinet. Although not every song was Irish-related, there was at least one song of Erin in every set. More information on this day in history at The People History. Sunrise Serenade: Are You All Reet? This morning's Sunrise Serenade was "Are You All Reet?" by Cab Calloway. Click on song title to listen courtesy of Jazz On Line. Big thanks to the Red Hot Lindy Hop folks for inviting me to DJ last Friday! We had a blast, and hopefully everyone's sense of rhythm will recover from some of the tunes I inflicted on them. The lessons and sessions continue at the Rumba Room this Friday, with another guest DJ, Jeff Miller of Virginia Beach. Free dance lesson at 7:00 p.m. with Kirk and Erin followed by music by special guest DJ Jeff Miller until 9:30 p.m. Salsa at 9:30 p.m.
On March 25, 2010, there will be a Sock Hop Social at the U of M featuring Jeremy Shrader's Quintessentials. More information at RedHotLindyHop.com. Today's Sunrise Serenade was "The Song Is Ended" by the Mills Brothers with Louis Armstrong. Click on the song title for the album page on emusic. Sample clip at Track #5. 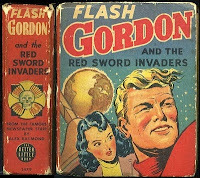 Golden Age Comic Book Stories posted a collection of Flash Gordon and Buck Rogers book covers from "The Better Little Book" series between 1934-1945. There is some classic Golden Age Sci-Fi artwork in this set. Thanks to Daylight Saving Time, today's Sunrise Serenade actually started at sunrise! It was "Harlem Air Shaft" by Duke Ellington and his Orchestra. Click on the song title to listen courtesy of Jazz On Line. 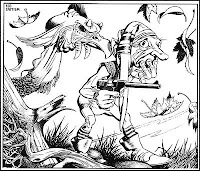 Here is one of my favorite Chuck Jones cartoons. From the Internet Archive, its the 1946 animated short, The Dover Boys. Dull Tool Dim Bulb posted a series of daredevil photographs from 1930, featuring the untimely demise of several never-to-be antique sedans and/or hot rods. The safety equipment in those days appeared to be simply quick reflexes, as the gentlemen at in the photo demonstrated. The Swing Shift Shuffle playlists are back! Click HERE for the filing cabinet where the playlists will be stored. At the moment, the cabinet contents are just the March 10, 2010 show, but older show playlists will be filed soon, as will playlists for future shows. Today's Sunrise Serenade was "Deep Henderson" by Ambrose and his Orchestra. Click on the song title for the album page on emusic. Sample clip at Disc 2, Track #9. The Make: blog posted not one, but two interesting items about naval camouflage. The first addressed "dazzle camouflage" which was intended not to hide the ship, but instead confuse optically operated rangefinders regarding the vessel's type, size, speed and heading. The second posting featured a warship that eluded the Japanese fleet in 1942 camouflaged as tropical island. In case you are wondering where the Swing Shift Shuffle playlists have gone, never fear. I am moving the playlists to a new location that will be open soon. In the meantime, if you have a question about something I played on the show, just e-mail me at tim@wevl.org. Thanks for listening and your patience! Just as a reminder that the musical term "rock" was around well before Elvis or the Beatles, today's Sunrise Serenade was "I Want to Rock" by Cab Calloway and his Orchestra in 1942. Click on the song title to listen courtesy of Jazz On Line. In 1942, the U.S. armed forces had a shortage of trained pilots, so they began training women to fly military aircraft in non-combat missions, which freed the male pilots for combat duty. A story on NPR reveals that now, after years of relative obscurity, the Women Airforce Service Pilots (WASP) are finally getting the recognition they deserve. Today's Sunrise Serenade was "Fairy Tales" by Ella Fitzgerald and the Mills Brothers. Click the song title for the album page on emusic. Sample clip at Track #20. The sample clip is only long enough to feature the Mills Brothers' section of the song, but you get the idea. The folks from Red Hot Lindy Hop graciously invited me to be a guest DJ at the weekly lesson and session at the Rumba Room this Friday. Radio not being the most visual medium, it will be an interesting experience to watch people listening (and dancing) to the music I play. Free dance lesson at 7:00 p.m. with Mike and Amanda followed by music with Yours Truly until 9:30 p.m. Salsa at 9:30 p.m.
Today's Sunrise Serenade was "Do Nothing Till You Hear From Me" by Count Basie and his Orchestra. Click on the song title for the album page on emusic. Sample clip at Track #7. 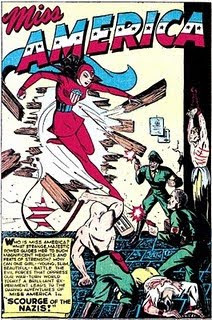 There She Is, Miss America - Fighting Nazis? Who knew Captain America had a female counterpart? I certainly did not until I saw Pappy's Golden Age Comics post about Miss America. I can imagine that beauty pagent schedule: 1) talent competition; 2) evening gown competition; 3) Axis fighting; 4) swimsuit competition; etc. Today's Sunrise Serenade was (appropriately enough) "I'm Beginning to See the Light" by Ella Fitzgerald and the Ink Spots. Click on the song title to listen courtesy of Jazz On Line. From the Internet Archive, Betty Boop cares for sick animals in A Song A Day (1936). 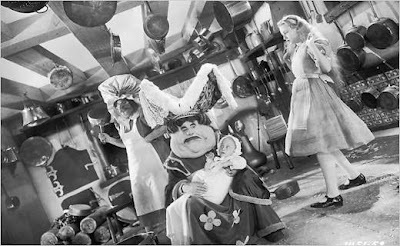 Boing Boing posted about the DVD release of the 1933 version of Alice in Wonderland, starring Cary Grant, Gary Cooper and W.C. Fields. There have been many more film versions of this story than I was aware, but this particular adaptation, in addition to featuring some of the royalty of Golden Age Hollywood, had the endorsement of Alice Liddell. Ms. Liddell was the woman for whom Lewis Carroll wrote the original stories when she was a child, in other words, the real "Alice". Today's Sunrise Serenade was "Doin' What Comes Naturally" by Dinah Shore. Click on the song title to listen courtesy of Jazz On Line. 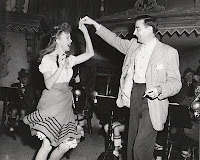 Film Noir Photos posted this 1947 photo of Ida Lupino practicing a folk dance with Director Peter Godfrey on the set of Escape Me Never. This image leads to me ask the question: Could anyone ever do anything in the 1940's without smoking? One would think a smoldering cigarette in one's hand might make dancing difficult, if not dangerous. Today's Sunrise Serenade was "Leap Frog" by Les Brown and his Band of Reknown. Click on the song title to listen courtesy of Jazz On Line. Click HERE for the Swing Shift Shuffle playlist from tonight's show. Since the Oscars are this weekend, I thought it would be appropriate to point out a very interesting article on actress Hattie McDaniel on TCM's Movie Morlocks blog. Best known for her portrayal of "Mammy" in Gone With The Wind, Ms. McDaniel was a strong and sparkling personality. She was the first African-American to win an Academy Award, beating Hollywood superstar and GWTW costar Olivia De Havilland for best actress. She was also the first African-American woman to sing on radio in America. Below is a clip from Thank Your Lucky Stars featuring her singing talents in "Ice Cold Katie." Apologies for not posting today's Sunrise Serenade until midday, but computer problems happen. This morning's song was "Smoke Rings" by the Mills Brothers. Click on the song title to listen courtesy of Jazz On Line. The weekly Red Hot Lindy Hop lessons and sessions continue at the Rumba Room this Friday. Free dance lesson at 7:00 p.m. with Jaredan and Becky followed by music with DJ Jaredan until 9:30 p.m. Salsa at 9:30 p.m.
Next week, yours truly will be the DJ. Today's Sunrise Serenade was "I've Got the World on a String" by the Spirits of Rhythm. Click on the song title for the album page on emusic. Sample clip at Track #4. I am pleased to announce that swingshiftshuffle.com and the Swing Shift Shuffle blog have merged into one site. All of the information on the original radio show website is now on this blog, including answers to frequently asked questions about the show, links, playlists, and of course, the blog. You can now get all your SSS information in one place. If I missed anything, just let me know by e-mail to tim@wevl.org. Thanks for listening and for reading! Golden Age Comicbook Stories posted a set of covers and advertising flyers from a science fiction series entitled Science Wonder Stories. The covers in the post run from June 1929 to May 1930. These offer an interesting glimpse into popular science fiction at the beginning of the Great Depression. The "Sunrise Serenade" is the music that happens to be running through my head when I wake up in the morning. Today's serenade was "Cuckoo in the Clock" by Benny Goodman with Johnny Mercer on vocals. Click on the song title to go to the album page on emusic. Sample clip on Disc #2, Track #21.